There’s more to the new North Branch Trail addition than meets the eye. It’s a great story to tell the kids or to share with a biking buddy as you try out the North Branch Trail addition. On the surface (literally), it’s a lovely new bike/pedestrian trail that slopes down from Green Bay Road, skirting the north edge of Turnbull Woods and linking up to the outer road of the Chicago Botanic Garden. But dig a little deeper (literally and figuratively), and you’ll find the reason for that slope: the “hill” is actually the remnants of a glacier. Its proper name is the Highland Park Moraine. It’s one of a series of five, collectively called the Lake Border Moraine System, found on the inland border of Lake Michigan. A helpful map for visualizing the ups and downs of the moraines and the valleys in between. Source: Luman, Donald E., LiDAR Surface Topography of Lake County, Illinois. ©2013 University of Illinois Board of Trustees. All rights reserved. LiDAR map courtesy of the Illinois State Geological Survey. Flashback to geology class: a moraine is a giant accumulation—a ridge—of clay/sand/gravel pushed forward by the leading edge of a glacier, then left behind as it shifts its motion and melts/recedes. Moraines vary in sizes and heights. Glacial ice that once covered northern Illinois began to recede about 14,000 years ago, leaving the five moraines, like scallops in the landscape, with the oldest to the west, the youngest to the east. Oldest and furthest west is the Park Ridge Moraine; to the east of it is the Deerfield Moraine. The lowland between them is the West Fork of the North Branch Chicago River. Third is the Blodgett Moraine; its creation dates back to 13,000-plus years ago. The valley between it and the Deerfield Moraine is the Middle Fork of the North Branch Chicago River. (The West Fork, Middle Fork, and Skokie Rivers come together to form the North Branch Chicago River.) Next comes the Highland Park Moraine, formed about 13,000 years ago; Green Bay Road was built along its crest. The Chicago Botanic Garden lies in the Skokie River Valley between the Highland Park and the Blodgett Moraines. Finally, a bit north and east lies the Zion City Moraine, the youngest of the five. 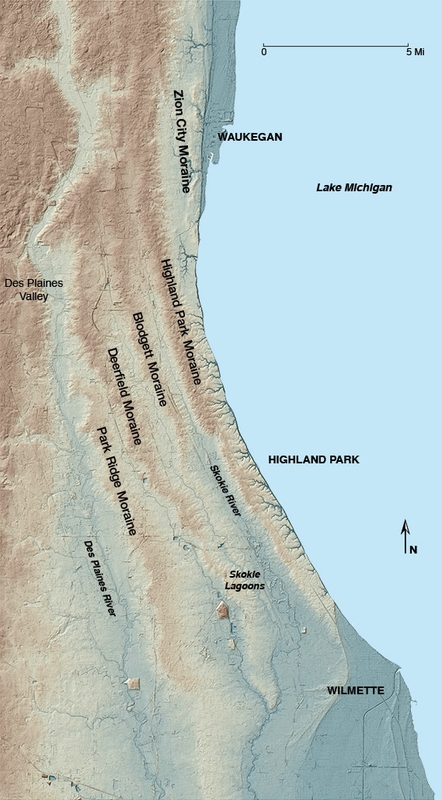 As if all that isn’t cool enough, the Highland Park Moraine is also a mini-section of the Eastern Subcontinental Divide: water from the Highland Park Moraine drains toward Lake Michigan (Great Lakes watershed) on the east side, and into the Skokie River Valley (Mississippi River watershed) on the west side. Most people are familiar with the Continental Divide near the middle of the country; a secondary divide travels along our edge of Lake Michigan. 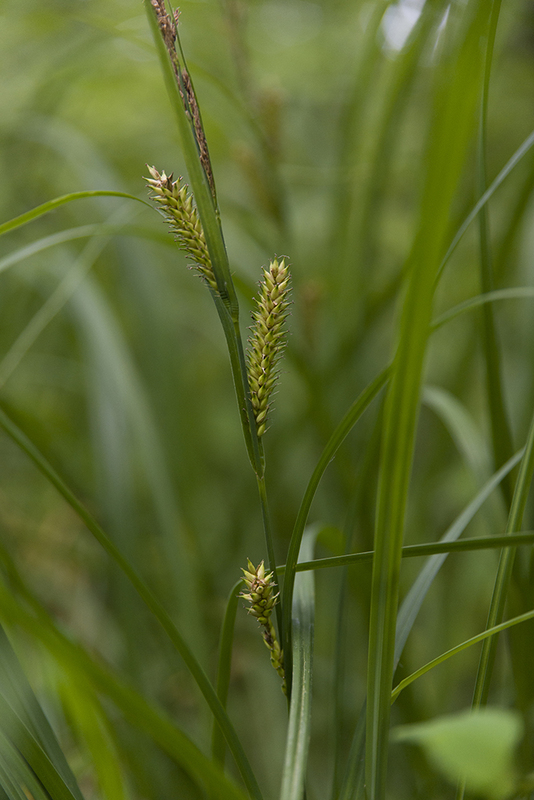 Sedges do well in spring rain/flood conditions, helping dissipate water through respiration. Planning for the new bike/pedestrian path included much deliberation about the plants that were already growing at the site. As construction neared, ecologist Jim Steffen reached out to Glencoe Friends of the Greenbay Trail and Betsy Leibson, who heads up the all-volunteer group, which is dedicated to restoring the sections of the Green Bay Trail bike path that run through their town (and ours). Steffen offered to donate hundreds of sedges (Carex pensylvanica and Carex hirtifolia) that were in the path of construction—and then helped Leibson and volunteers dig them up for transplanting along their trail. The sedges are reportedly thriving. GFGT showed their appreciation in such an appropriate way: see their July 14 post about it here. It’s safe (for all the bike riders who’ve wobbled in a vehicle’s wake on busy Lake Cook Road!). It’s ADA-accessible: 10 feet wide, smoothly paved, and appropriately inclined. It’s convenient for pedestrians heading to and from the Braeside Metra train station. It’s family-friendly for strollers and toddlers, and shepherding groups of kids toward the Garden. It’s the long dreamed-of and anticipated mile-long missing link between Cook County’s North Branch Trail and Lake County’s Green Bay Trail. How smart is this? A special membership for those who ride their bikes to the Garden instead of driving. With plenty of perks included (discounts, member magazine, tax deductibility), but sans parking privileges, it’s a sensible and cost-efficient (just $50 annually) way to show your support for the Garden. A membership makes a great gift for the bikers in your life, too. Really nice piece on the new bike trail. But I believe there’s a mistake when you say, “the valley between it and the Deerfield Moraine is the Middle Fork branch of the Des Plaines River.” I think it should say, “…Middle Fork branch of the Chicago River.” As a kid, we called it the “creek,” something that we often waded in or floated makeshift rafts in. Thanks again for the wonderful story and great new bike path! Our mistake! The valley between the Blodgett and Deerfield Moraines is the middle fork of the Chicago River. Thanks for your sharp eyes—we’ve corrected the text above. Not to be picky, but isn’t it the Middle Fork of The North Branch of the Chicago river? Jim, thanks for your correction—we misidentified the river in that sentence and have changed our text to read “North Branch Chicago River,” not “North Branch of the Chicago River.” —Karen Z. 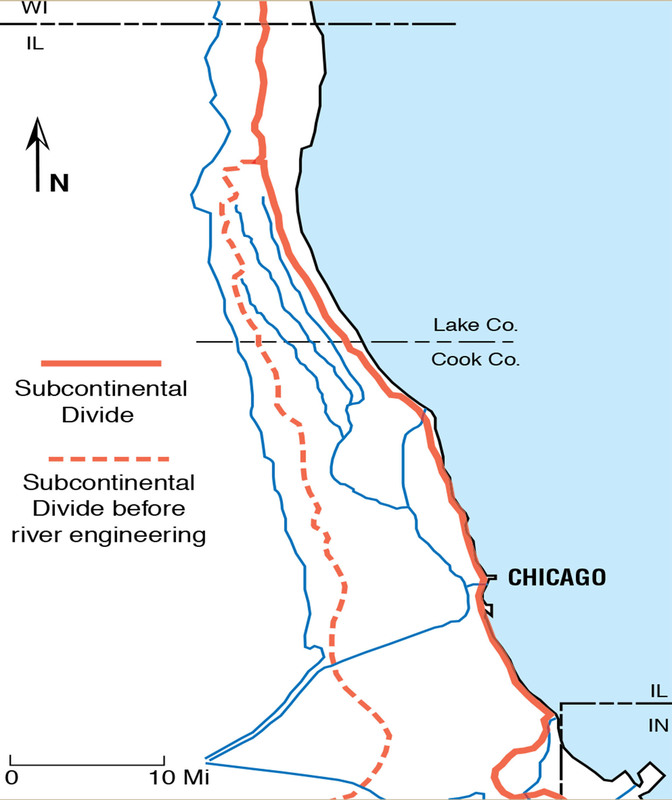 Before the Chicago River’s flow was reversed, the subcontinental divide was the Park Ridge Moraine separating the Des Plaines and Chicago River watersheds. As left by the glaciers, the Chicago River flowed into Lake Michigan, so it should be clarified that the watershed line has been changed by human intervention. If you include the Chicago River in the Mississippi River watershed, then Lake Michigan (and Huron and Superior) would be also. You’re right about the human intervention, and there’s another map that illustrates that point along the new bike trail. Here’s a photo.